This is about the 2002 Chinese movie. For the 1992 movie released in America as Hero, see Accidental Hero. For other uses of "hero," see Hero. 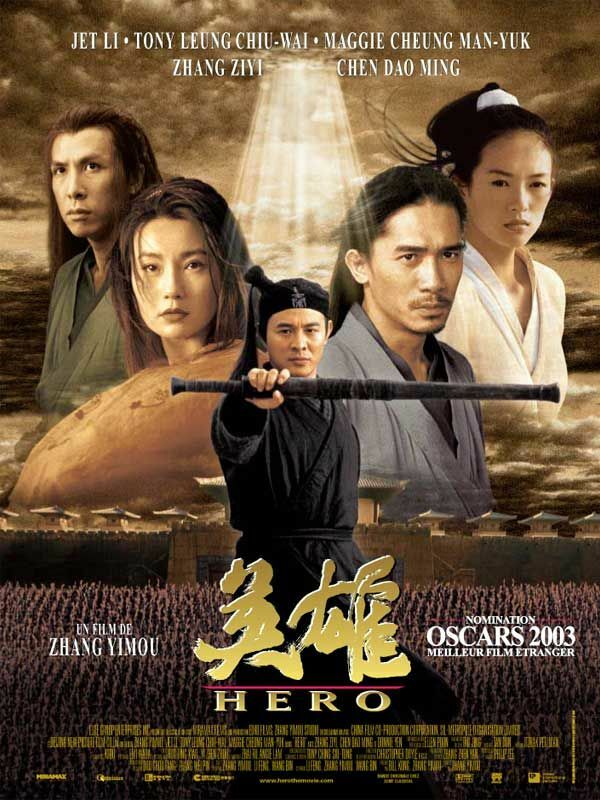 Hero is a 2002 Wuxia film directed by Zhang Yimou; it stars Jet Li, Maggie Cheung, Zhang Ziyi, Tony Leung and Donnie Yen. The film is set in the troubled transitional period between the Warring Kingdoms and the Qin Dynasty, when the ruthlessly despotic King of Qin was in the process of annexing the other kingdoms of China and incorporating them wholesale into his own. 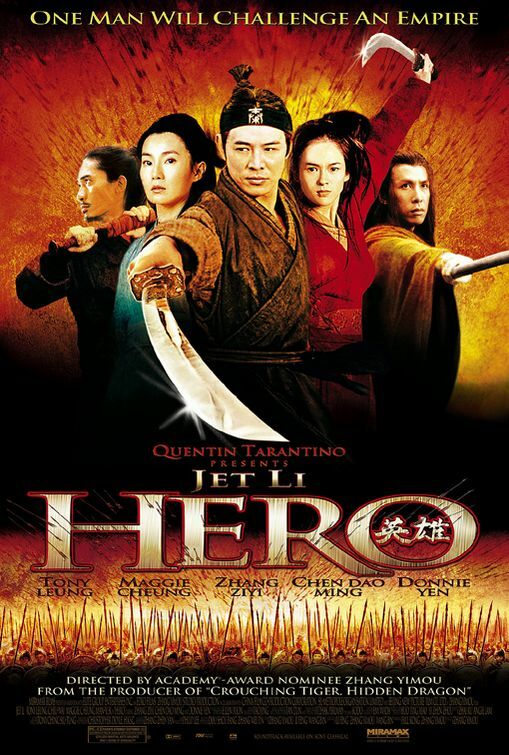 Jet Li plays "Nameless", ostensibly a minor official who claims to have vanquished three assassins—Broken Sword, Flying Snow, and Long Sky—who wanted to kill the King before he could declare himself Emperor. As "Nameless" tells his story to the paranoid King, things turn out not to be as they seem. The movie generated political controversy, as the ending was interpreted by some as a justification of despotic rule and thus an endorsement of the current Chinese authoritarian regime. Action Girl: Flying Snow and Fading Moon. Antagonist in Mourning: The King of Qin realizes that, despite their differences, Nameless actually understands him better than anyone else ever did. After his soldiers execute Nameless, the King gives him an honorable burial out of respect. Armor Is Useless: None of the assassins wear any armor. The shields carried by the royal guard are apparently made of styrofoam, judging by their resistance to the swordstrokes of Flying Snow and Broken Sword. The King wears armor to protect himself from assassins, but is still aware that Broken Sword and Nameless are capable of killing him at will. Arrow Cam: The film uses one to follow an arrow flying into the calligraphy school. Arrow Catch: When an arrow breaks the rod that Broken Sword was using to practice his calligraphic skills in sand, he grabs the next arrow and uses it to resume his writing. Authority Equals Asskicking: While the King is outmatched by the four assassins, he gives Broken Sword more of a fight than his entire army. Nameless averts this: While he is the second-strongest swordsman in the film—surpassed only by Broken Sword—he is only a lowly prefect. Battle Couple: Flying Snow and Broken Sword. Battle in the Center of the Mind: Nameless versus Sky is one of these, according to one version of the story. The Blade Always Lands Pointy End In: This happens with the King's sword, and it is done deliberately at that. Bloodless Carnage: The film shows lots of people being stabbed, chopped, or shot with arrows, but it has only two scenes with any blood whatsoever: under Broken Sword after he is killed by Flying Snow in the first version of the story, and on the sword Fading Moon throws at Flying Snow in the following scene. Bodyguarding a Badass: Two assassins assault the imperial palace, cutting through a small army to do so. When they reach the King, the weaker of the two stays behind to hold off the whole army alone, while the other goes in to duel the King in single combat. "The Imperial Guard are not worthy of mention", indeed. Broken Bird: Flying Snow is one. Fading Moon becomes one at the end of the film. Central Theme: "One person's pain is nothing when compared to the suffering of all." In other words: Uniting a collection of warring kingdoms does far more good than taking revenge on your homeland's enemy. Sometimes, submitting to a hated foe is ultimately for the best. Chastity Couple: Snow and Sword are this in the blue flashback. Close-Call Haircut: Fading Moon severs a lock of Flying Snow's hair at the beginning of their battle in the red flashback. Color Wash: The entire film is this, in obvious fashion. Conservation of Ninjutsu: During the green flashback, Flying Snow and Broken Sword storm the castle of the King of Qin. The assassins carve through three thousand imperial guardsman; one-on-one, the King poses much more of a challenge. Cool Old Guy: The master of the Zhao calligraphy school qualifies. As arrows rain down on the school and students flee in panic, he announces that today they will learn the true spirit of their art. He sits down at the front of the room, then calmly begins practicing calligraphy. He is so badass that the students hurry to return to their seats and follow his example. There has been some criticism of the Miramax release of the film for its mistranslation of one of the central ideas in the film, "tian xia" (天下), which literally means "all under heaven." During the period in which this film is set, the ancient Chinese people believed that they were at the very center of the universe; the Mandarin term for China is "zhong guo" (中国), meaning "central realm," as many believed the region to be between heaven and hell (much like the Germanic Midgard). With that in mind, Broken Sword begs Nameless that the King of Qin be allowed to succeed, because the peace he will bring will benefit not just China, but everyone around them (metaphorically) — "all under heaven" (literally). In this case, the term should be interpreted metaphorically. But as the average American viewer is probably unaware of China's self-conception, mistranslating "tian xia" as "our land" is a simple way to avoid explaining it. During his fight with Long Sky, Nameless addresses the old blind musician as "sir" in the Miramax translation, while on the import DVDs, Nameless calls him "old man." Actually, Nameless said "lao xiansheng" (老先生), which means something along the lines of "old gentleman." "Lao" means old, and "xiansheng" is a polite way of addressing men, similar to "sir" or "mister" in English. Broken Sword and Flying Snow use the aliases Highcliff and Springbrook, respectively, while hiding in the calligraphy school. However, there is no mention of this in the English dub or Miramax English subtitles. During the famous scene in which the Qin army barrage the calligraphy school with arrows, the soldiers' cries were changed from "hail" to "storm" in the Miramax release to avoid a Nazi connotation. In the English versions of the film, once it was revealed that Nameless can non-fatally stab people so that they look like they are slain, we never go back and find out what happened to Long Sky, who isn't dead and has recovered from his wounds. In the original Chinese version, the closing sequence reveals that Sky decided to abandon martial arts in honor of the way Nameless and Broken Sword gave their lives. Dark Is Evil: The Qin Emperor, his army and his court all wear black or other dark colours, as does Nameless who is a lowly Qin prefect. This is historically accurate, as the Qin really did favour black, but Played With in the end since the film suggests that the Qin Emperor be seen as an Anti-Villain and Well-Intentioned Extremist rather than truly evil. Death Seeker: Nameless is one. Broken Sword convinced Nameless not to kill the King, but Nameless knows that he could not live with himself if he did not confront him just once. In the end, Nameless willingly submits to the King and allows his soldiers to kill him. Delayed Causality: During the demonstration of "death within ten paces," Nameless cuts up all the bookshelves in a single move. Naturally, the bookshelves do not actually fall apart until a few seconds after he has returned to the center of the room. The Emperor: The King of Qin. The Empire: Qin, pronounced "chin," a.k.a. the future Chin-a note The King of Qin had wanted to live forever. He couldn't, but he has survived in one way. The word "Qin," pronounced "chin," had given us the word "China." In a way, the First Emperor's name will never die. The usual depiction of an empire as evil is subverted as the new Empire of China being forged by Qin Shi Huang Di is depicted as a potentially positive force that can bring order and peace to the people of China, provided that the Emperor can be induced to provide the right kind of leadership. It is implied that he did. Evil Overlord: Subverted. The King of Qin is initially presented as an evil overlord, but Broken Sword argues that in unifying China, the King has actually done a great service to the people. Broken Sword still believes, however, that the King needs a lesson in humanity to earn the loyalty of his subjects. The film was sometimes criticized for being overly kind to the King. Face Death with Dignity: Ultimately, all three main characters: Nameless, Broken Sword, and Flying Snow. Faced with what he believes is the moment of his death, The King of Qin tries this, as he calmly gives Nameless his sword and turns his back on him. However, it's subverted twice: First by Nameless refusing to kill him, and secondly by the King plainly showing fear at the last moment. Flynning: Typical for an Eastern martial arts film, the swordfights in the film are characterized by combatants doing acrobatics and clashing their weapons, producing the trademark "tink-tink-tink" sound. When Nameless tells the King about his visit to Broken Sword's calligraphy school, he mentions a surprising number of variations of the calligraphic character for "sword". The King says the variation in language causes far too much confusion; he believes the kingdoms of China need a shared common language. In the end, Nameless submits to the King specifically because the former knows that the latter's efforts will ultimately unify China and create peace between the kingdoms. Standardizing the written Chinese language is one of the key achievements by Qin Shi Huang, and it is specifically referenced at the end of the movie. During the green "memory" scenes: "The truth of calligraphy has to be intuitively grasped. It is the same with swordsmanship. Both seek to return to a state of simplicity. Gradually, I began to understand." When the arrows rain down upon the calligraphy school, one student takes an arrow to the head and dies instantly. You can briefly see pieces of styrofoam fly about when Broken Sword and Flying Snow chop through the shields of the imperial guard, showing how the props are made of styrofoam so the actors could chop them apart with ease. "In any war, there are heroes on both sides..."
A Handful for an Eye: Snow does this to Moon during their battle. Snow also stabs Broken Sword from behind her sleeve in the blue section. Heroic Sacrifice: Nameless and Broken Sword both make one. Highly Visible Ninja: Well, Chinese assassins in this case. Broken Sword and Flying Snow carve though the King's royal guard and walk right into his throne room, foregoing the pretense of secrecy that one would expect from an assassin. The King . Even the most idealistic interpretation of the movie cannot drag him entirely free of the gravitational pull of the Moral Event Horizon he crossed in real life. But to its credit, the film does not try. Nameless. The actual assassin upon whom Nameless is based used mere deception to get into the throne room, then drew a poisoned dagger and chased the King around the throne room until the King could draw his sword and stab him. Hobbes Was Right: The Leviathan, specifically in the form of the new Chinese Empire being created by The Conqueror Qin Shi Huangdi, is depicted as the best hope for the Chinese people because of the order and peace that it will bring. Honor Before Reason: Just about every character does this except the King. Except at the end, when the King is willing to die—and gives his sword to Nameless for that reason. He had claimed earlier that he was not so noble as to die for idealism, because he discovered Broken Sword understood what he was trying to do. How We Got Here: The King and Nameless have differing explanations. I Know You Know I Know: The King deduces Nameless's plot after listening to his story. Implausible Fencing Powers: As with any wuxia film, the abilities of the warriors are supernatural. At various points, they deflect storms of arrows without getting nicked, slash arrows in half in midair, swordfight on water, and chop through shields effortlessly. Importation Expansion: The opening and closing sequences of the American version were changed from the original. Changes for the opening sequence include the addition of a map of ancient China and a different description; the line "In any war there are heroes on both sides..." is not present on the original Chinese version. The closing sequence has a different description. In the original Chinese version, it was not outright stated that Nameless was executed as an assassin but buried as a hero. That line was presumably added to make it easier for viewers to understand that Nameless was given a hero's funeral. Improbable Weapon User: Flying Snow is able to deflect storms of arrows with only her very long sleeves, and in the extended cut, Fading Moon protects Broken Sword from the arrows barraging the calligraphy school using only a piece of stick. Interface Spoiler: The English subtitles sort of lessen the visual shock of the fact that Nameless spared the King since his whole sentence appears subbed all at once, ignoring the pause that he puts into his sentence that sets up the big reveal. Kill 'em All: All three protagonists are dead at the end. Killing Intent: The candle flames in front of the King. He's smart enough to figure things out from there. Knife Outline: The King's imperial archers shoot so many arrows at Nameless that the arrows which fail to hit form a "shadow" of arrows on the wall behind. Lie Detector: The King's candles react to the dishonesty in Nameless's first story. Lonely at the Top: The King of Qin refers to himself as gua ren (寡人), literally meaning "lonely person". His paranoia causes him to keep a supposedly safe distance from his courtiers and guards at all times. During the film he comes to realize that the only people who understand him are his mortal enemies: Broken Sword and Nameless. Both are dead by the end of the film (with the King being forced to execute one of them). Fittingly, the last shot of the King is him standing in his cavernous throne room, completely alone. Magic Realism: The whole film. Manly Tears: The King sheds these for Broken Sword and Nameless. Messy Hair: Both Flying Snow and Broken Sword have this during the red flashback. Mundane Made Awesome: Calligraphy, which is linked to both bravery and swordsmanship. At the calligraphy school, the head teacher insists that the students make a last stand practicing calligraphy as arrows rain down on them. Broken Sword's swordsmanship is directly linked to his skill at calligraphy. During the battle at the school, Broken Sword casually practices calligraphy amidst the downpour of arrows; he later paints a majestic banner. No Name Given: Nameless was orphaned at a young age and was never given a name. As a result, people just call him "Nameless". Not So Different: The King and Broken Sword. This is demonstrated when the King can interpret Broken Sword's calligraphy while Nameless cannot. Nameless and Flying Snow have the ability to block and deflect storms of arrows with nothing but a sword and some very long sleeves (respectively). Three years prior to Nameless's arrival at the palace, Broken Sword and Flying Snow both cut through thousands of palace guards as if they were cardboard as part of an attempt to kill the King. Out-of-Character Alert: The King of Qin catches on to the real plot because he knows skilled assassins like Flying Snow and Broken Sword would not be laid low by the petty squabbles Nameless claims to have manipulated them with. Overshadowed by Awesome: Fading Moon loses every fight she's in. The people she fights are at a level of skill where two of them can take down an entire army, which means she's an excellent fighter. Plus, at least one of those fights never happened. Properly Paranoid: The King says everyone is out to get him. Turns out, he's right. "Rashomon"-Style: Practically the whole movie is this. Different versions of Nameless's story are displayed in the form of color-coded flashbacks. The Reveal: Midway through, the film reveals that Nameless was lying about his entire story—he is in league with the assassins. The King then narrates what he think happened, after which Nameless describes what actually happened. Rousseau Was Right: The film has no truly "evil" characters—all of them are trying to make the world a peaceful and happy place in the only way they know how. Including the King of Qin. Rule of Cool: This film practically runs on it. Rule of Symbolism: During the duel between Broken Sword and the King, Broken Sword knocks the King's sword out of his hand and then seemingly cuts his throat. The sword sails through the air and cuts into a stone pillar, severing a carved dragon's head from its neck. It's immediately subverted, however, when it is shown that Broken Sword only gave the King a shallow cut, and lets him live. Saving the World with Art: Broken Sword achieves enlightenment through his calligraphy, which eventually inspires the King. One of the film's many swordfights takes place on—yes, on—a lake that is perfectly still and gives reflections like mirrors. This is a real lake in China; the surface is only that placid for about three hours a day. With the set-ups required for Wire Fu, the filmmakers could get maybe two shots done during those three hours. During the fight between Broken Sword and the King, the King realizes Broken Sword is lurking behind the banners in his court. The King cuts down the banners; they all fall to the ground in the most majestic way possible. Scheherezade Gambit: Nameless is given a rare audience with the King to tell him a story about how a lowly prefect defeated three powerful assassins. The story is an excuse to receive an audience with the King as part of an assassination plot. Scry vs. Scry: The duel between Nameless and Long Sky plays out entirely in their minds, save for the final blow. Sherlock Scan: The King keeps his throne room filled with candles so he can determine the trustworthiness of his guests by studying the candle flames. If a guest is breathing hard enough to visibly move the flames, the King takes that as a sign of devious intent. Single Tear: The King of Qin sheds one tear when he realizes the only man who understands him is one who wants to kill him. Sliding Scale of Idealism vs. Cynicism: Disputed. The film could be a treatise on having faith in fundamental human decency, which is quite idealistic. It could also be a treatise for submission to government authority and the belief that peace is worth more than liberty, which is quite cynical. Small Role, Big Impact: Long Sky has only one real scene—his fight with Nameless—but much of the plot hinges on that one scene. It puts Nameless on the King's radar, thanks to having bested one of the greatest warriors in the land. That defeat lets Nameless drive a wedge between Long Sky and Broken Sword in the first scenario. In the real scenario, Long Sky's defeat and survival are what proves Nameless's skill with the sword. Events such as Nameless's meeting and discussion with Long Sky are narrated to the audience and his role in Nameless's assassination plot is conveyed without him being present. Supernatural Martial Arts: The protagonists all display examples of this. Storming the Castle: Broken Sword and Flying Snow do this so they can attempt to assassinate the King. Thanatos Gambit: Nameless and Broken Sword both plan to use their own deaths in a way that furthers their goals. Together in Death: Broken Sword and Flying Snow. Two Guys and a Girl: The three assassins, especially in the red flashback. Utopia Justifies the Means: Broken Sword believes a peaceful, united China is worth the bloodshed and conquest that will bring it together. Warrior Poet: Broken Sword, with calligraphy. Long Sky, with weiqi. Wire Fu: Plenty of it. World of Badass: Just about everyone in the film with a speaking role is a supreme badass. Worthy Opponent: The King of Qin recognizes Nameless as this when his assassination attempt fails. Long Sky is this to the marshals attempting to arrest him—they let him walk off after he defeats them and spares their lives. You Killed My Father: Flying Snow's Disappeared Dad was a Zhao general who fell in battle against the King, which is the main reason for Snow's bitterness.